From what I understand, ELP's Welcome Back My Friends... live album was made up of representative material recorded during the groups Someone Get Me a Ladder tour of 1973-74. Originally released on 3 vinyl records (later as a 2-CD set), this is ELP's answer to Yes' Yessongs. Though not anywhere in Yes' league, this is probably the best live recording ever released by ELP, so much so that the album charted higher than any other ELP offering on the musical charts of the day. The most important reason for getting this album is the stunning performances of ELP's two biggest prog epics: Tarkus and Karn Evil 9. Both time in at extraordinary long lengths, 27:24 and 35:21 respectively (proof that the 30-minute long song existed before the Flower Kings). The unfortunate result of this was that the songs were split up on the original vinyl releases. I have yet to acquire this on CD and hope to someday assuming these songs are in their entirety as is suggested on the track listing. 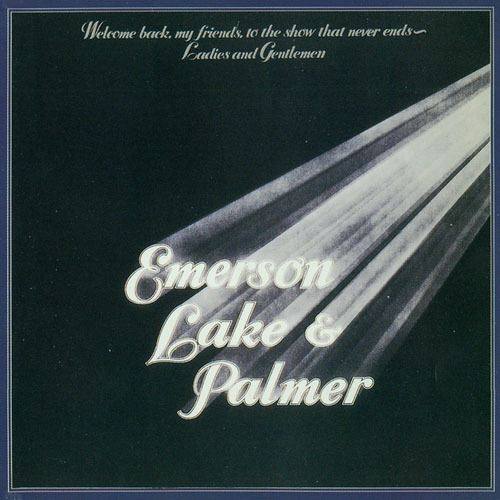 Other than a couple bad selections, like Jerusalem and Jeremy Bender/The Sheriff, this is a really fantastic collection documenting ELP during its peak years. Highly recommended and a must-have for ELP fans. Easily four stars, maybe slightly more.